Connie sat in front of her computer screen browsing Craigslist when she hit upon an ad showing a Belgium horse for sale.’Humm’, she thought ‘Johnn loves Belgiums’. As a lark she printed out the ad. That evening, she handed the print out to Johnn. Johnn thought, ‘We really don’t need another horse but what a beauty. Just looking won’t hurt’. So the Ballentines went to look at the big, strong Belgium, fell in love and bought him from the horse dealer. The sun gleamed on emerald fields in November across Bradford County. Usually, this time of year a frost or two caused grasses to become yellow and dormant; however, the high rainfall and warm weather continuing into late fall resulted in lush green pastures. Emma and I arrived at Horse Heaven ready to enjoy the crisp fall day, when Johnn told us that there would be a new arrival at the stables. “You’re kidding,” I said noting the excitement in Johnn’s voice. “It’s true. He’s gentle, bigger than Myrtle, trained to saddle and harness. I picked up his feet with no problem.” said Johnn still smiling. “He sounds great. When will he arrive?” I asked feeling a sense of delight with the idea of another horse at the stables. “As soon as I can get someone with a trailer to deliver him, probably Thursday,” he replied. Emma and I saddled up and headed for the park. The sky, a brisk electric blue emitted a cool glow which fell over the autumn landscape. We passed people working, playing and simply enjoying one of the last days before winter turns everything frosty. After the ride, we put up our saddles and drove home wondering about Sam. Thursday came and Sam easily walked onto the trailer in Monroeton. He rode in the bumping trailer along the winding country road until reaching Ballentine’s Horse Heaven. Johnn’s new horse calmly walked off the trailer and into his stall. The next day he went out to pasture with the herd, walked down to visit with Jupiter until Jupiter turned away leaving Sam alone. A few days later, on November 18th, Karen emailed me pictures and a video from her iphone. Shadow and CJ chased Sam. 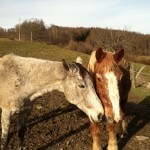 They seemed to be playing until the little brat, bad boy CJ cornered Sam near a ravine in the pasture. CJ bit and kicked Sam until he moved off. A few days later, I saw Johnn in the stables and mentioned it. “I didn’t see the video but I saw him picking on Sam in the lower pasture. CJ cornered him and kicked Sam until he moved away,” said Johnn. “I saw Myrtle look like she was going to bite him a few times, “I said. Horses are highly social animals which have a dominance hierarchy with new comers starting at the bottom often driven to live at the edge of the herd for a period of time. Wild horses are organized in a “harem type group” with one stallion and a group of mares. Even though a stallion is in the group, the herd is led by a dominant mare called the “boss or lead mare.” The dominant mare determines such things as when the herd travels, the safest route and where to graze. Domestic herds are a bit different since most don’t include a stallion and are made up of mares and/or geldings. 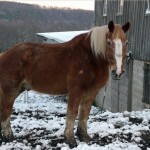 In a domestic herd, either a mare or gelding becomes the dominant member of the group. The dominant horse directs the behavior of the other horses within the herd. The higher-ranked animals in the herd if given the opportunity will eat and drink first. Fights for dominance usually are brief and many times involve gestures without physical contact such as barred teeth or pinned back ears. I’d take a guess that Myrtle is the lead mare at Horse Heaven, with Pepper ranking second. CJ as Pepper’s offspring is closely aligned with her. I’m guessing again, but would say CJ is defending her rank or simply ranks higher than Sam. However, it’s not that clear-cut. 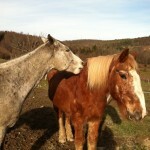 The horses usually hang out with another horse within the group; Myrtle with Shadow and Pepper with CJ. The lone horse at the edge of the herd is Jupiter. Now that Sam has come to even out the numbers, it seems logical that Sam and Jupiter should pair up; however, that doesn’t seem to be the case. Instead, Shadow befriended Sam. These inner herd relationships seem to change overtime. Last year, I observed Shadow, Pepper and CJ forming a small inner group, now I usually see Shadow and Myrtle together. The earth tilted away from the sun in its yearlong orbit; each new night came earlier than the last as we neared the winter solstice making 5:30 PM very dark. I drove up to the barn to brush CJ and Pepper, pulled into the drive and saw lights on in the barn. I put on my hat, stepped out of the car into the cold night air, and entered the stable where everything had the glow of halogen lights. Connie topped off the horse’s water pails completing her final ‘everything is ok’ check for the night. Sam stood peaceful and comfy in Pepper’s old home across from Myrtle. All the horses munched hay and looked content nestled in their stalls. “Hi Connie… how’s Sam doing?” I asked. “Good,” Connie replied pouring water into Jupiter’s pail. “Where did you get him?” I said watching Jupiter munch hay. “The horse dealer we bought him from was the same one that sold me that crazy, palomino Tennessee Walker years ago. The woman gave me the phone number of the girl she purchased Sam from. Her name is Jessica and I called her. She sold me his saddle and threw in the stand, saddle blanket, bridle and a whole box of horse care produces,” said Connie. “Did she tell you much about Sam,” I asked. “Jessica said he was in the Troy Fair this summer and her 9 year old brother entered him in the Barrel Racing event. Sam is very gentle, calm and well trained. The only thing we’re not clear on is his age. The horse dealer’s vet said he was 20 years old, but Jessica’s vet said he’s 12 or 13. I’m going to have Gene and Brianne look at him, maybe they can tell how old he is,” said Connie. “He’s pretty skinny,” I said. A few days later, I met Anne Shaffer in the barn and we rode to the park. CJ and Shadow stretched their legs as we raced up the hills through Round Top on the late autumn morning. Turning for home Anne mentioned her ride on Sam. “I’ve hear draft horses have very even gaits,” I replied. “He does, but I had a heck of a time getting him out of the pasture. Myrtle kept chasing him. It was hard to get him pass the other horses,” said Ann turning Shadow onto Weaver Road. “That must have been more than a bit scary,” I said. “It was unnerving,” Anne replied. Thanksgiving slipped by with Christmas on the way. 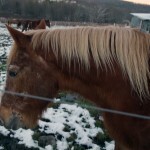 Sam learned the routine; stand in front of the barn with the other horses, wait for Johnn to open the doors at feeding time and go out to pasture in the morning. Yesterday, I snapped some photos of Sam. Not wanting to be in the middle of a dominance battle, I opened the barn door leading to the pasture just enough to fit the camera through. To my surprise, Sam stood right up against the door. A few seconds later, Myrtle chased Sam off and stood eyeing me wanting to come in for her grain. I slipped the door shut, walked around the barn and stood next to the fence. Sam in his slow amenable manner came towards me; as soon as he did Shadow quietly came over and stood next to Sam. That was too much for Myrtle, she pinned her ears and made a dive at Sam driving him off. Sam calmly took his place at the back of the line. 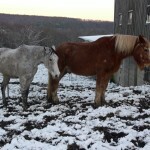 A few minutes later Johnn opened the barn door letting the horses in for the night. Sam walked in last. By far, he is the biggest horse in the pasture, even if right now he holds the lowest rank as the months go by perhaps that will change, perhaps not, only time will tell. 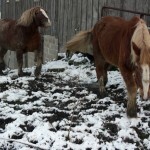 This entry was posted in Uncategorized and tagged Ballentine's Horse Heaven, Belguim, herd behavior, horse herd dominance, horse herd psychology, new horse at stables. Bookmark the permalink.